No, sorry, it was today that was properly teeming. 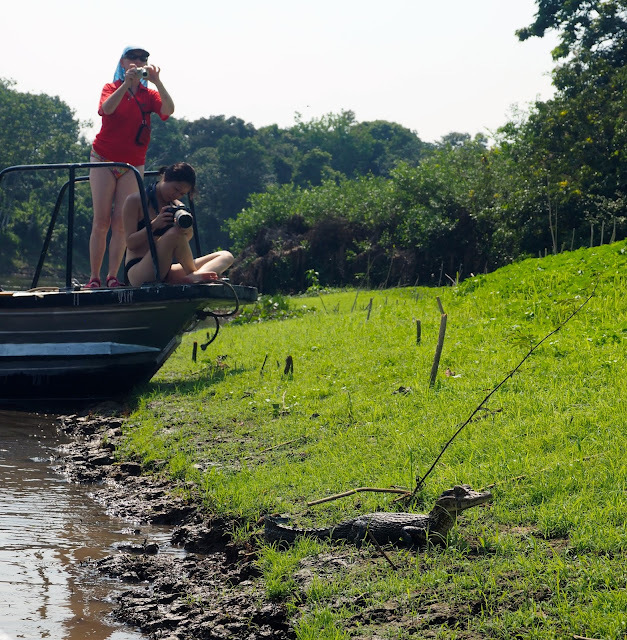 We set off early with our togs on under our clothes and went up the Pacaya River into the Pacaya Samiria Reserve, a huge wetland, biggest reserve in South America, that’s heaving with creatures. There were birds for Africa, if you see what I mean, including a tall jabiru which was trying to swallow a too-big fish that threatened to choke it. Then we found a pod of pink dolphins also busily feeding, popping above water much less than their marine equivalents, clearly pink in the glimpses we got of them. There was a flock of ungainly hoatzins, like startled chickens with Mohicans, blundering about in a tree overhanging the river. Cormorants, the rabbits of the river, flew straight ahead of the boat, not thinking to turn aside; flocks of green parakeets flew overhead. There were even troupes of spider monkeys, moving fast through the trees. We breakfasted in the skiffs moored under a big fig tree, served fruit, sandwiches and pastries on woven mats and colourful plates, with glasses of juice and cups of coffees. Even the woven straw decorations weren’t forgotten, tied around the serviettes. Delfin II is style all the way. And then we got to the lake, where we were assured there were no piranhas or caimans, and most of us leaped in, waving aside the proffered noodles until discovering, almost immediately, how much hard work it is to stay afloat in warm, fresh water; after which we all wrapped them around us and wallowed with great pleasure in the tannin-stained water. Then, of course, five minutes after getting back into the boats, we found caimans – not big, but still caimans. No matter, we were pleased to have another photo opportunity. Then we worked on catching a shot of the turtles sunbathing on logs, as we returned to the Delfin II for a “mandatory pre-lunch nap” according to Juan Luís. The rest of the day was equally dedicated to R&R, even the evening skiff excursion a mellow affair centred mainly on the sunset across the water. After dinner things changed suddenly though: the staff put on a concert of remarkable talent and energy, room attendant Jose the star with his guitar/Pan pipes combo as well as vocals, Pedro the waiter showing great facility with his guitar, the chef turning out in a revealing jungle outfit, and even the captain, warming up on percussion, suddenly finding his mojo and leaping into the spotlight with some very lively dancing. It was fun – and yes, the programme did include ‘Guantanamera’. Of course - what did you expect?